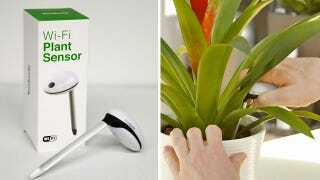 If you've been using Koubachi's iOS app to remember when it's time to water your plants, the company's new wireless sensor will give your greenery an even better fighting chance of survival if you're lacking a green thumb. Whereas the app used your location, the local soil conditions, and the type of plant to make an educated guess as to when it needed watering, misting, or fertilization. Koubachi's new Wi-fi plant sensor takes the guesswork out of the equation, automatically measuring moisture, temperature, and light.